Healing, Balancing, & Detoxing with Beautiful Warmth To Relax Your Body! 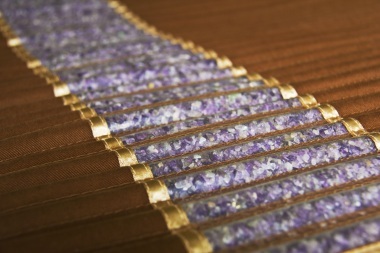 The Amethyst Biomat is a Very Effective Healing Treatment that detoxifies the body in a very gentle yet powerful way. It brings the body back into it's natural alignment. It works in a similar capacity to Reiki & other healing modalities. The other benefit is the warm radiant heat that moves throughout your body during a session. Sore muscles relax, the body unwinds, deep relaxation occurs. It's like a mini holiday! The Amethyst BioMat contains more than 28 pounds of amethyst crystals which naturally produce and are superconductors of far infrared rays. This energy radiates through the layers containing the Japanese Kurare Carbon Ceramic Super Fiber Material generating long wave far infrared rays that the human body can easily absorb. The amethyst crystals amplify these bio natural rays so that they can penetrate the body up to six inches. By comparision, other far infrared technologies only penetrate 1 to 1.5 inches. The Amethyst BioMat also has a special feature of direct conduction of negative potential that transforms positive ions into negative ions inside the human body which changes body pH from acidic to alkaline promoting a natural healthy state. Far Infrared Therapy can promote cell metabolism, circulation, the elimination of poisons, carcinogenic heavy metals and other toxic substances that the body encapsulates in water molecules and stores in the subcutaneous fat cells. The Amethyst BioMat is Registered With the FDA in the USA (Medical License Device #29544299). Far Infrared -Though it is invisible to the human eye, approximately 80% of the sun's rays fall into the far infrared range. It is simply a form of energy that is directly transmitted into objects because of its specific wavelength. First discovered by NASA, scientists propose that it is the most beneficial electromagnetic energy available for the human body, directly affecting all metabolic and cellular functions. Negative Ion - The key players in creating the electrical energy within our body are structures called ions. Cells create electrical energy as ions move from the solutions inside the cells of our body to the solutions outside the cells. This becomes the energy source that initiates body functions ranging from muscle contraction to creative thought. Amethyst Crystal has been deemed "nature's tranquilizer" by many healers because of its effectiveness in relaxing not only the mind but also the nervous system. It is described as the crystal that works for clearing the energy blockages to provide the proper alignment of the chakras and the free flow of energy through them. It aids with sleep, improves mood, helps reduce inflammation, detoxifies the body and enhances relaxation. Love The Mat? You Can Rent One For A Whole Week! For people who LOVE the biomat and want to use it for an entire week! Rent a Mini Amethyst mat for a week and use it as much as you like. The mini mat fits easily on a chair, a couch, or a bed. It's smaller size makes it easily portable. It covers the main areas of the body ~ from the neck to the base of the spine, or you can lay it under whatever body part needs healing, pain relief or relaxation. With adjustable heat settings. Please call 905-689-8100 to arrange rental times, or e-mail to book. Do You Want To Own Your Very Own Amethyst Biomat? We Can Help You With That!